After yesterday's carnage, our only thought today was the three days break in Lhasa. First though we had to drive 480km over a 5200m pass. Last night Snowy's front suspension was removed, driven over 70km of broken road to Dingri, welded into some sort of shape, driven back to where Snowy lay stricken and refitted. Tintin then drove the van very slowly back to the hotel ready for today's journey. What an epic. Although long, today's drive was mainly on good roads so the bikes with broken suspension could be ridden even if doing pogo impressions over any large bumps. The route took us over a high pass then down a narrow twisting gorge with the road hugging one side. On the other side the Chinese are building an extension of the high speed train network. No nonsense, the track carves round hillsides, punches through tunnels and strides across open ground on enormous pillar legs. How can they build something on this scale in two years when it will take the UK 20 years to build high speed lines to its second city? Lunch in a Tibetan restaurant consisted of a whole lamb leg, roasted in spices and served with yoghurt and spicy potatoes. Eventually the river widened into a broad valley splitting into multiple channels carrying the milky blue water on to form the great rivers of Asia. 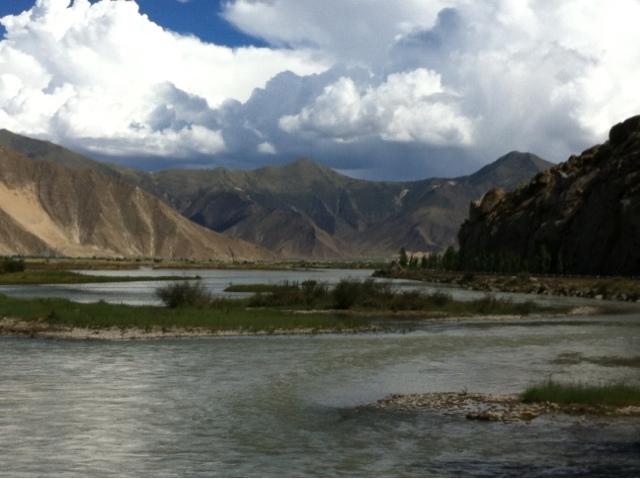 Then we were in Lhassa. Mad traffic, mad rickshaws, mad pedestrians, holes in the middle of the road et al. To our hotel, an oasis of calm with space for all the bikes in the courtyard. And then dinner at Dunya. This amiable ex-pat bar run by a Dutchman served excellent Yak steak and chips with a fresh tomato salad and cold beer. Luxury.